In Canada there is at least $1 billion lying in forgotten bank accounts, unclaimed securities, court awards and other assets that have lost touch with their owners. It is estimated that the Bank of Canada alone houses $600 million in these so-called unclaimed assets, while in Ontario there could be $100 million. These assets are essentially lying dormant, often sitting on balance sheets or invested in government bonds until their owner either comes forward or the claim deadline passes. This is an enormous pool of capital that could be used to advance social policy priorities. With the right regulatory framework, Canada could release millions of dollars of this money and put it into impact investments in affordable housing, employment, poverty reduction and other priority areas. A well-designed strategy would also ensure that sufficient funds would be available to repay original asset holders if they come forward. It’s been done before. In the U.K., Big Society Capital, a capital wholesaler two-thirds financed by unclaimed assets, invests in British funds and intermediaries which then invest in charities, nonprofits and social enterprises. Big Society Capital has signed deals worth £261 million, a sum matched by £326 million from other investors. It will eventually put £600 million toward affordable housing, employment and training, financial inclusion, and other social solutions. In Canada, governments could direct more capital towards important policy priorities at little additional cost by following in Big Society Capital’s footsteps. This is not without its challenges, however. In Canada, the fate of unclaimed assets is governed by a patchwork of regulations that fall under different jurisdictions. Unclaimed assets at the Bank of Canada, for example, stay on the books for decades, invested in government bonds, before they are claimed or transferred to the federal balance sheet. British Colombia, Alberta and Quebec have legislation governing unclaimed assets, while in other provinces, no such laws exist and these assets sit with the financial institutions, insurers, employers and government departments where their owners forgot them. The MaRS Centre for Impact Investing has begun consultations with a wide range of stakeholders to gather views on what a strategy for unclaimed assets might look like and how it might be implemented. Contact us if you’d like to share your views. To stimulate debate around unclaimed assets, we’ve produced a consultation paper setting out the broad strokes of the case for using them for social impact. 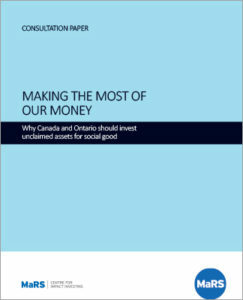 Making the Most of Our Money: Why Canada and Ontario Should Invest Unclaimed Assets for Public Good looks at how big the pool of unclaimed assets could be, where they are held and suggests structures under which they could be invested for social impact.